It wasn’t the wedding they planned, but the Fitzgeralds seem to have no regrets about their marriage last weekend. 30-year-old Garrett Fitzgerald was one of four on-duty Secret Service agents hurt in a car crash in New Hampshire last month while working a security detail for Hillary Clinton. On the job for only a few weeks, Fitzgerald was hurt the worst, and remains paralyzed from the waist down. So instead of walking her down the aisle, Joan Fitzgerald's father walked her across the ICU at Mass General to her waiting groom Saturday. The two were married by a Catholic priest, with Joan in her mother’s pearls and Garrett in his vest and tie. 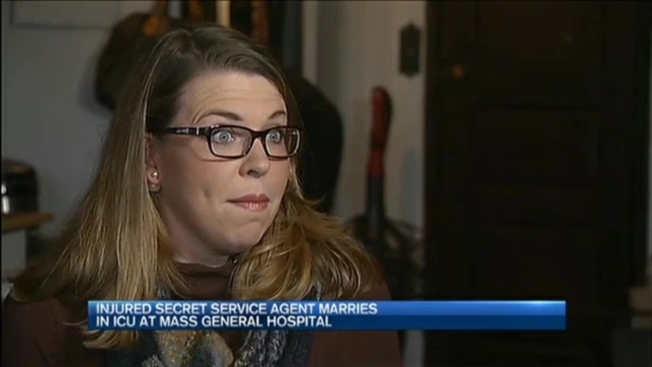 Garrett has been moved to a rehabilitation hospital and isn't ready to talk publicly, but his new wife says he wants to walk again and hopes go back on duty with the Secret Service. More than 2-thousand people have donated nearly a quarter of a million dollars to help Fitzgerald as he recovers. His wife says he plans to write thank you notes to every single one of them. You can check out their fundraising page here.